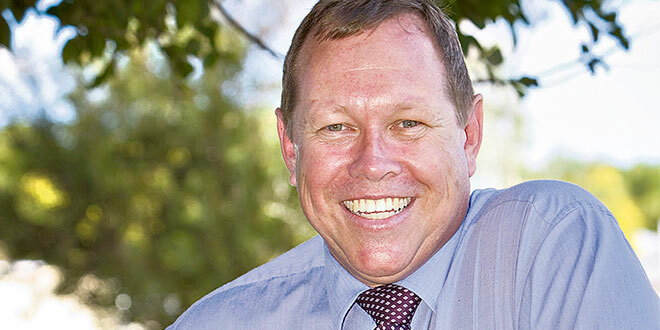 New position: Former Catholic school principal Michael Nayler is now the secretariat director of Queensland Aboriginal and Torres Strait Islander Foundation (QATSIF). AFTER surviving a brain aneurysm during Book Week celebrations last year, former Catholic school principal Michael Nayler has decided to spend the rest of his life supporting indigenous students in Queensland. Mr Nayler is the newly appointed secretariat director of the Queensland Aboriginal and Torres Strait Islander Foundation (QATSIF), which last year provided scholarships to 2290 indigenous students across the state. The career shift for the Catholic educator of 31 years was partly the result of a health scare in October last year that landed the former principal of St Michael’s College, Merrimac, in hospital for two weeks. Mr Nayler was about to give a Book Week speech on Winston Smith, from George Orwell’s classic book 1984, to the school when he felt a “thunder-clapping headache”. He was suffering a burst aneurysm, but decided to continue with his speech before being rushed to hospital for emergency surgery. Parishes and schools across the Brisbane archdiocese offered their prayers for the long-time educator. The health scare was a “wake-up call” to “re-evaluate my life”. This led to a new opportunity to pursue a long-time passion for indigenous education, which Mr Nayler found at his first teaching job at San Sisto College 30 years ago. He eventually landed a job at St Teresa’s College, Abergowrie, a boarding school dedicated to teaching Australian indigenous and Papua New Guinean students. Mr Nayler spent nine years as the school’s assistant principal for religious education and was instrumental in setting up traditional Aboriginal, Torres Strait and PNG dance troupes, who performed before 70,000 Queenslanders. Some of Mr Nayler’s high achievers include indigenous Cape York man Dion Creek, who was featured in the SBS television series First Contact. “I wanted to encourage Aboriginal and Torres Strait Islander students to achieve their best and embrace culture,” Mr Nayler said. He continued to work with indigenous and non-indigenous students at Mt Maria College, Petrie; St Peter Claver College, Riverview; St Mary’s College, Kingaroy; and finally at St Michael’s. His teaching career in Catholic education landed him as the inaugural 2014 recipient of the Community Leader Awards’ School Leader of the Year. “I’m sad to leave the Catholic community after thirty-one years, but I’m excited to be reaching out to indigenous students right across the state and hopefully make a bit of a difference,” Mr Nayler said. 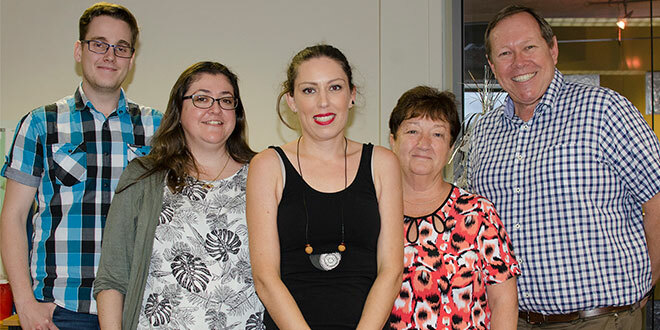 Creating leaders: Queensland Aboriginal and Torres Strait Islander Foundation members project officers Billy Neagle, Sonia Norbido, Tiana Brockhurst, former QATSIF secretariat manager Narelle Mullins and new QATSIF secretariat director Michael Nayler. Photo: QATSIF. In his role at QATSIF, he will face the challenge of meeting high demands for scholarships among indigenous students. Through QATSIF, families of indigenous students can apply to receive $1000 a year during Year 11 and 12 to financially support their education. Mr Nayler said indigenous families were grateful to receive the QATSIF scholarship, which was drawn from interest earned through the organisation’s trust fund and some donations. Last year the foundation offered scholarships to 476 indigenous students of Catholic schools, 1658 students in the state sector, and a further 158 students attending independent schools. Families are encouraged to apply for the scholarship while students are in Year 10. “One thousand dollars a year doesn’t seem like much but, to an indigenous family, it’s a uniform, or the feeling of pride to be able to wear shoes to school,” Mr Nayler said. As well as providing scholarships, Mr Nayler also hopes the organisation can support indigenous Queenslanders involved in a class action inquiry into historic stolen wages. Mr Nayler started his new role on January 8. “And I’m hoping this will see me right through to the end,” he said.